Auricle piercings are made to the ear rim and placed on the outside of the ear about in the centre or middle. Auricle piercings are made to the ear rim and placed on the outside of the ear about in the centre or middle. The piercing is made in the flat cartilage near the rim, being a cartilage piercing and therefore you are more likely to feel more pain. It is important that once the piercing has been done that you try to minimise and pressure on that piercing even during sleeping. Typical healing time for an Auricle piercing would be between 3 and 9 months but could take even longer depending on the individual. 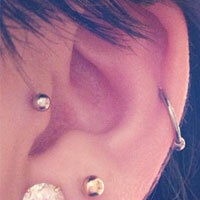 Popular choices for jewellery for Auricle piercings are labret studs. These labret studs have a flat disk at the back so will help to minimise the possibility of catching the piercing with your hair or clothes. Bioplast Labrets are an ideal solution as they are very light weight and being bio-compatible they can also help with the healing process. Labret studs are also more comfortable to wear during sleep. Other jewellery to consider are Ball Closure Rings, Segment Rings and CBB or Horseshoe Rings, all of which are available in a variety of style and colours. 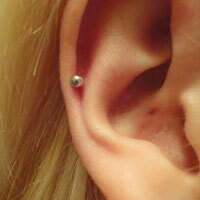 The Auricle piercing can be either 1.2mm (16 gauge) or 1.6mm (14 gauge). The most common lengths for labret studs and barbells used is Auricle piercings would be either 6 or 8mm. If you are looking for rings or horseshoes than a slightly bigger 10mm size may be better.